I’ve had my head down working on my upcoming release for the Essentials by Ellen line, but I needed to congratulate a young lady on her recent graduation from a dental assistance program and I couldn’t help it—I had to foil the card I wanted to make for her. Used low profile dies and the Gemini FoilPress (you can see a how-to-video HERE). This design also called for more sequins than usual; looks so purdy with the foil, right?! Thanks for stopping by today and hope your weekend has been splendid! Letterpress has always been my favorite type of stationery—I adore the clean, white space, elegant simplicity, and the luxurious texture of the paper and the debossed images and text. I’ve been searching for a long time to find a way to do this at home, without an actual press (which I have no room to store/operate anyway). I’ve tried lots (and LOTS) of different methods, but none of them really ever gave me the professional looking results I was hoping for. This has come the closest, and what I also find exciting is that it didn’t make me tear my hair out with lack-luster results. It’s FUN, I didn’t get frustrated, and holy crow, I wanna foil and letterpress ALL THE THINGS!!! Can you hear the monkey clappin’???? Notes and suggestions for what I found worked for me are listed directly beneath the video. All supplies I used are listed at the end of the post. The Gemini FoilPress is designed specifically for use with the Gemini Junior; it is also compatible with the regular Gemini, if you use the Extender Plate (available separately). I don’t know if it works with a manual machine, i.e. the Big Shot because I haven’t tried and am unlikely to—the last thing I want to do is break or void the warranty on either machine. The FoilPress uses THERMAL foil; this foil transfers images using a “hot foil stamping” method that requires heat and pressure. Thermal foils will also transfer with sticky mediums such as double-sided sticky tape, double-sided adhesive foam, sticky embossing powder, dries-tacky types of glues. Toner reactive foils, such as iCraft Decofoil, Minc Foils, etc. perform as described; they require toner and heat to transfer (foil images). Toner foils will also transfer with sticky mediums such as double-sided sticky tape, double-sided adhesive foam, sticky embossing powder, dries-tacky types of glues. HOWEVER, these foils do NOT work with hot foil (metal) stamps (dies). Sidebar: The Minc is a heat laminator type machine and is designed to work with toner images, NOT hot foil stamps. Would I risk it? Nope. The FoilPress comes with pretty much everything you need to get started, however, you may need your Gemini Junior Magnetic Shim and/or the Gemini Junior Metal Cutting Shim in some instances. 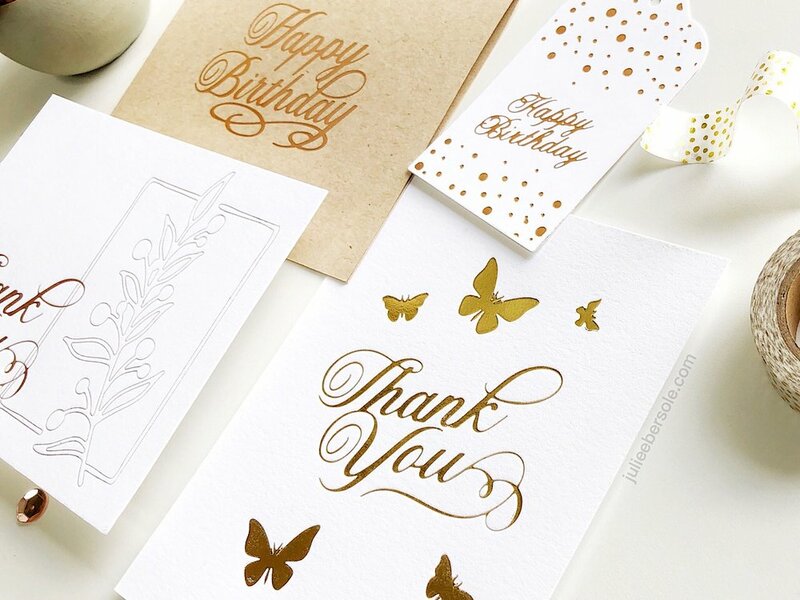 You can foil using the FoilPress on pretty much any paper surface, including card stock, letterpress paper, and vellum (results may vary; I haven’t tried vellum as of this writing). You can also foil with the FoilPress on other flat materials such as leather, thin wood veneers, acetate, cotton fabrics, ribbon. Non-paper surfaces will require multi-surface thermal foils; multi-surface thermal foils are not suitable for paper, according to Crafter’s Companion. I haven’t tested that personally, but I’ll take their word for it. You can use ANY low profile dies to foil with the Gemini Foil Press and Gemini Junior so long as their maximum depth is no more than 1mm; any thicker could damage your machine and will void the warranty. Crafter’s Companion advises against foiling with embossing folders; doing so will void the warranty. Download the Material Matrix from Crafter’s Companion and keep it somewhere you can refer to it easily when foiling. The Manual is a good starting point and I encourage you to take a few minutes to read it. Always use foil stamps design side up (when foiling low profile dies, place them blades up on the platform; you do not want to cut into the purple silicone heating pad). Place foil pretty (colored) side against the foil stamp/die; the “ugly” side of the foil goes against your paper. Keep in mind you are working backwards/in reverse order, so you won’t be able to see through the foil when placing your paper on top of it; a template like I show in the video may be helpful. Use the grid lines to help with planning your layout and to align things straightly. Once you remove the heated platform from the base, leave it disconnected or use the top panel power button to shut off the heating element until you are ready to foil your next project; it doesn’t take long to reheat when you reconnect/power on the temp setting. If you keep it connected and constantly heating, you will decrease the longevity of the heating element, as well as end up with inconsistent results from overheating. *With the Cut n’ Foil stamp I happened to be using in the video, I couldn’t get good results with the manual’s suggested sandwich nor the timing. Experiment to find your sweet spot, as every machine is calibrated slightly differently. Hope you found this helpful and that it has you excited about the possibilities now available! This is not intended to be a fully comprehensive guide to the FoilPress—I’m just sharing what worked for me during my play time. OK? OK.
Let me know down below in the comments, if you’d like to see more FoilPress videos from me! Dad’s birthday is this week, and I wanted to make him a card that “fit” him. My dad is such an interesting man, with a great sense of humor. I love the stories he tells about his time in the USCG, when he was a kid growing up—even if I’ve heard them before, I never get tired of them. FLORA & FAUNA CELEBRATE THEIR 2ND BIRTHDAY! A DAY WITHOUT COFFEE . . . I design, share and teach with products I love and use; all opinions expressed are my own. I am a self-employed creative, and do participate in several affiliate programs. When you make a purchase via my links, I receive a small commission from the affiliate provider, at no cost to you. Your support is appreciated more than I can say. But, I’ll still say it: Thank you!!! ©2019 Julie Ebersole, All Rights Reserved. That's right; all this content right here? Mine! Mine! Mine! If you steal it, bad juju will follow you all the days of your life. Truth.